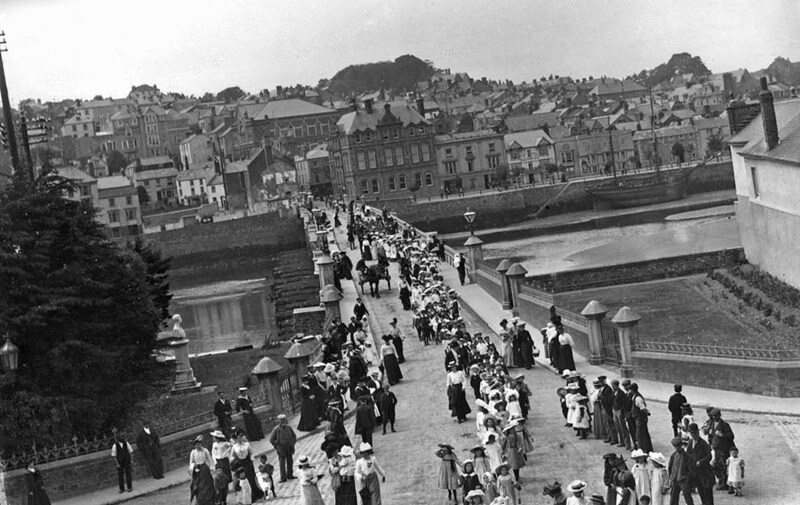 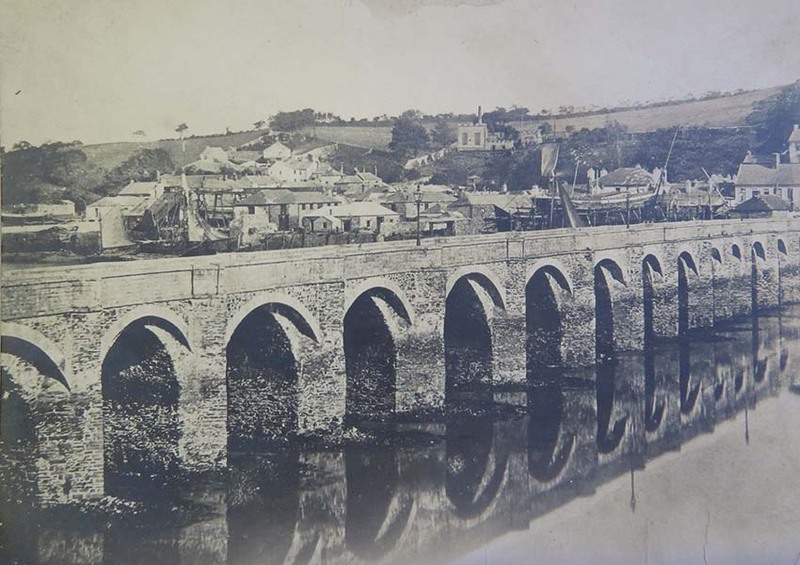 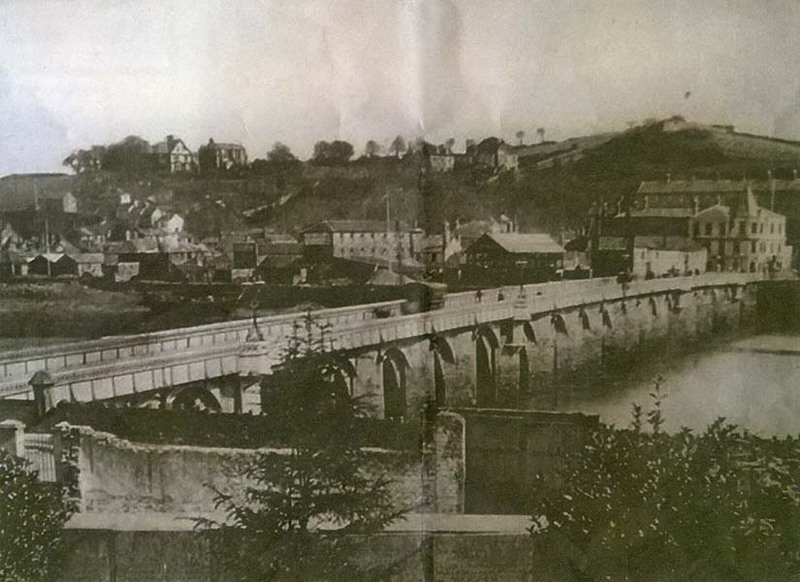 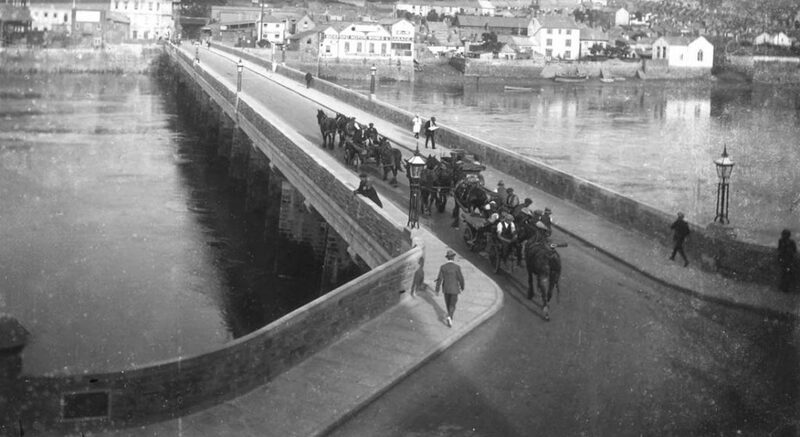 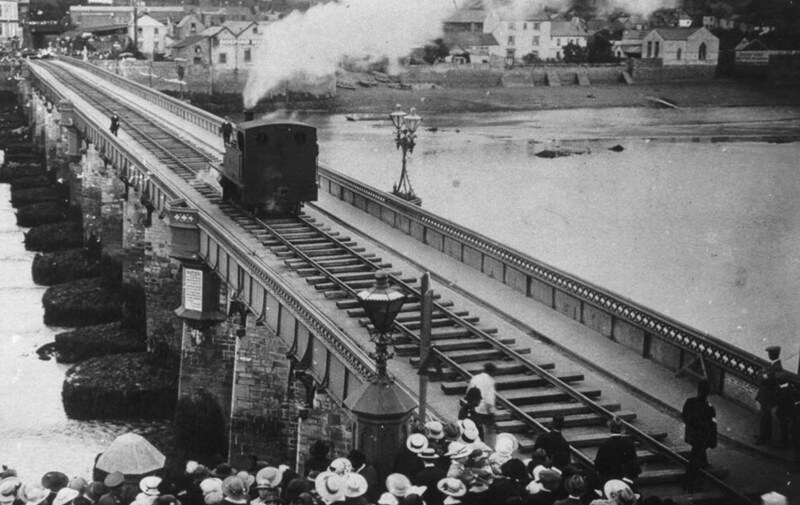 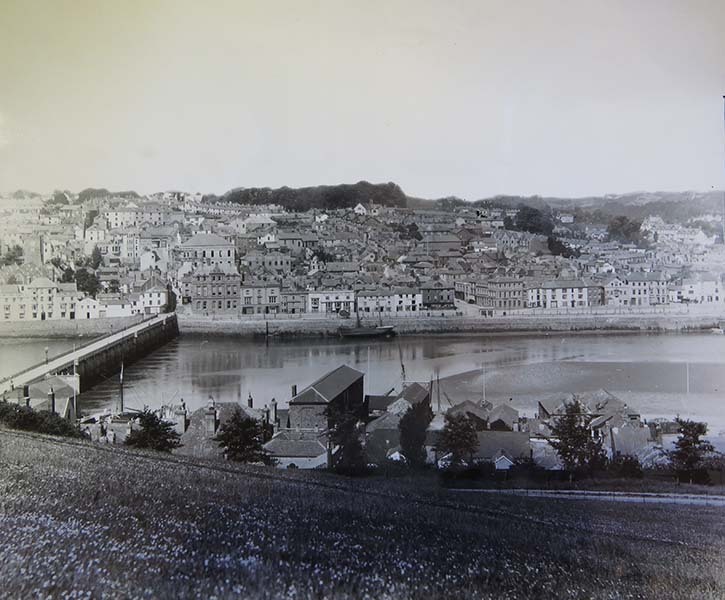 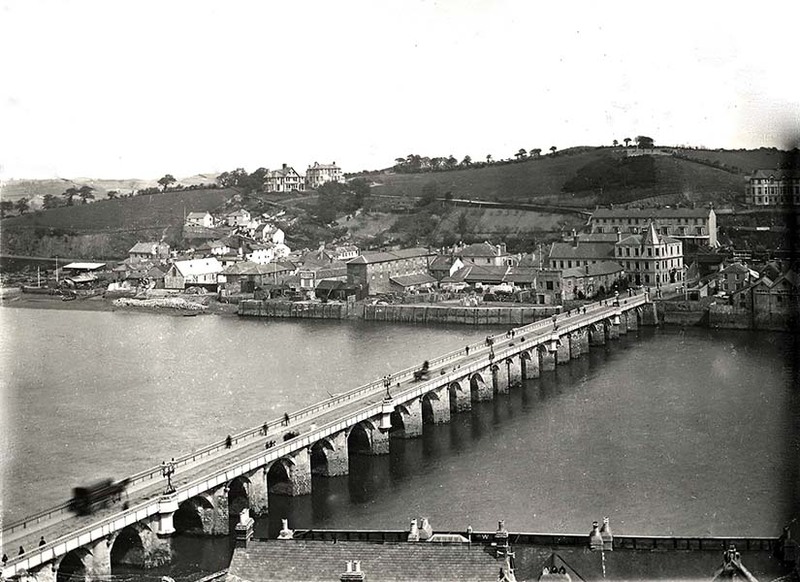 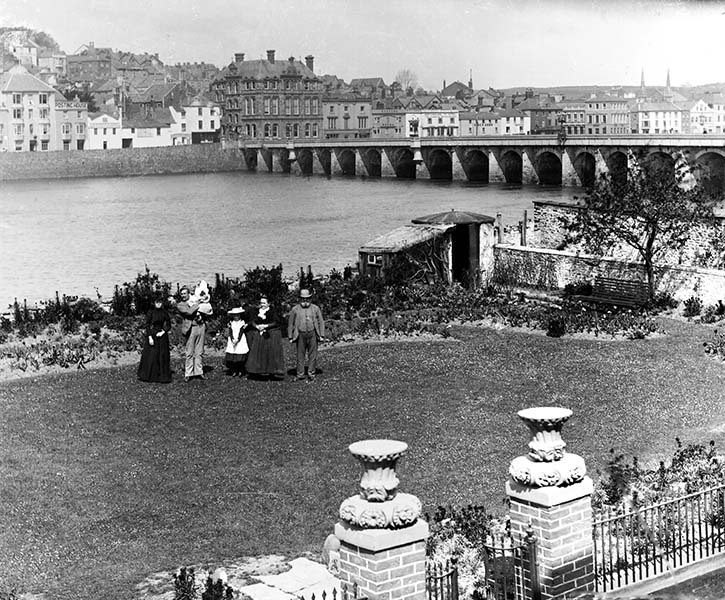 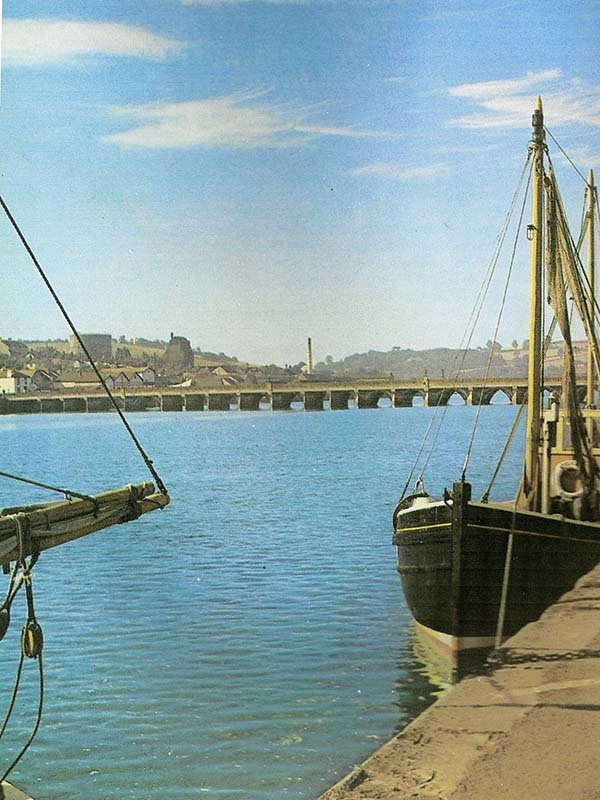 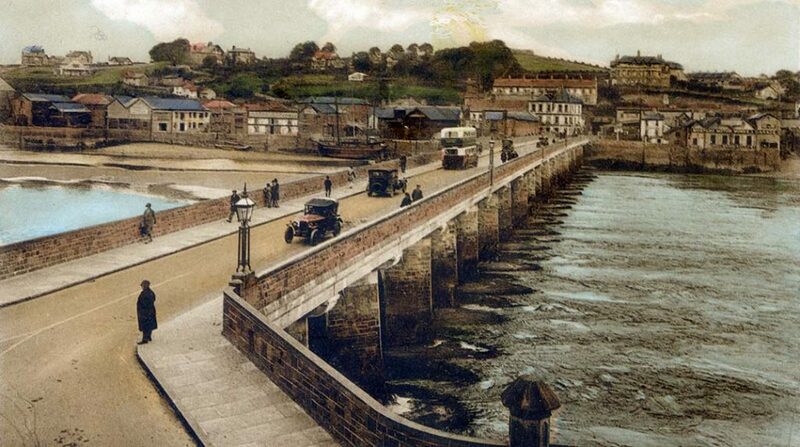 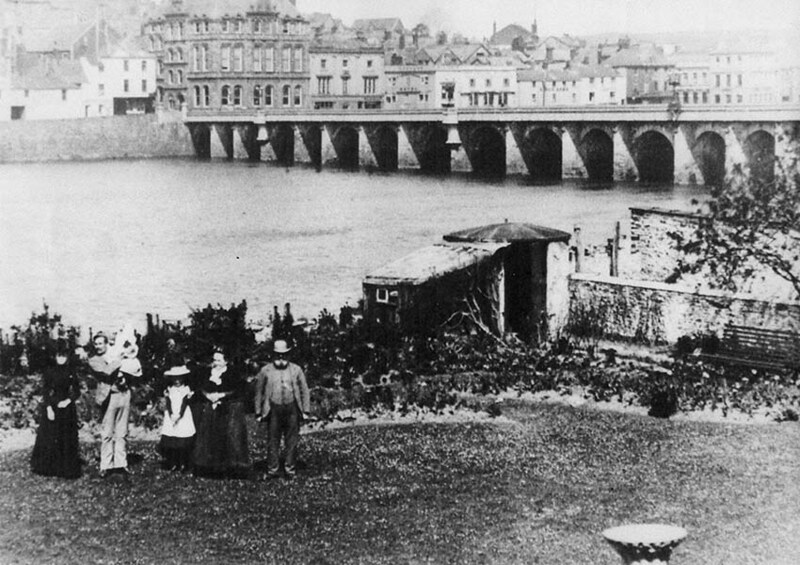 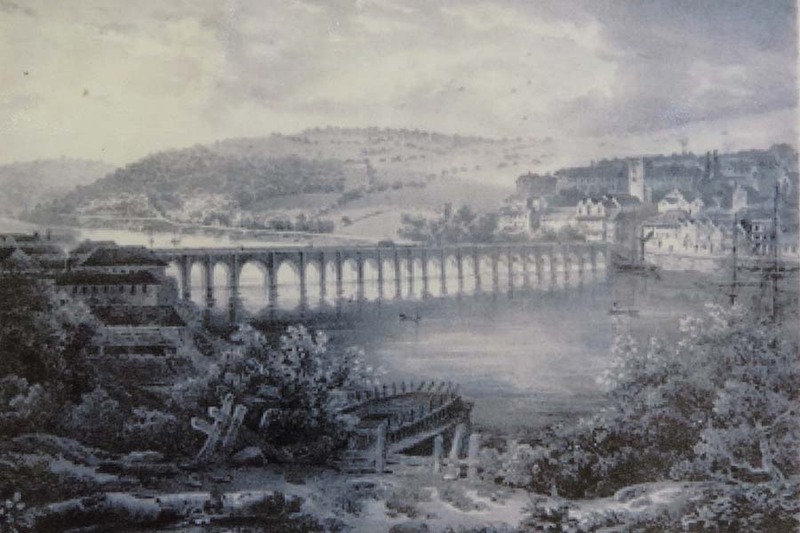 As traffic increased on Barnstaple Street (at that time the main route from Barnstaple into Bideford, and onward into North Cornwall), it became necessary to widen the Long Bridge. 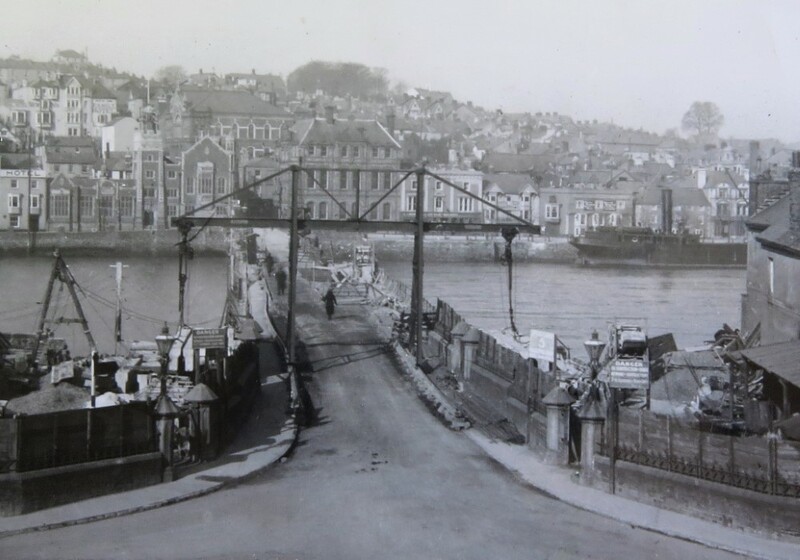 Barnstaple Street itself was widened soon afterwards. 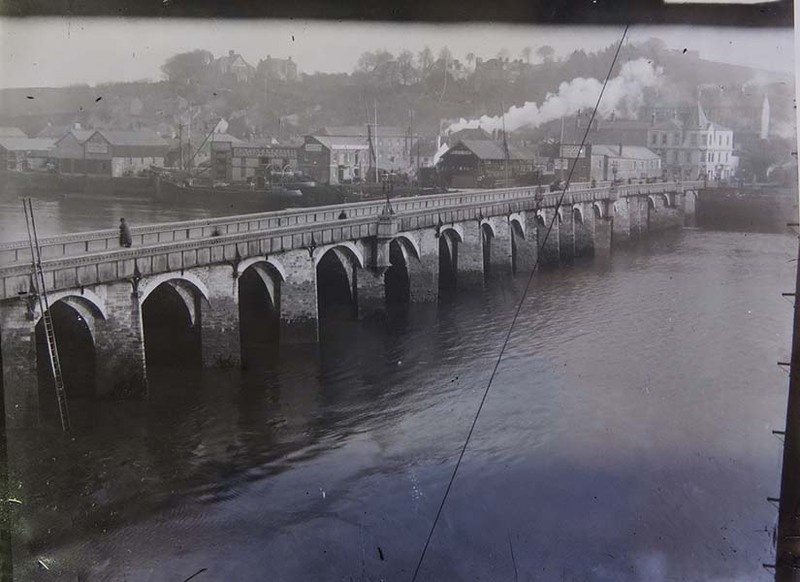 The Bridge’s iron parapet was replaced with a stone one (though its cast-iron kerbs may have been re-used from the earlier bridge). 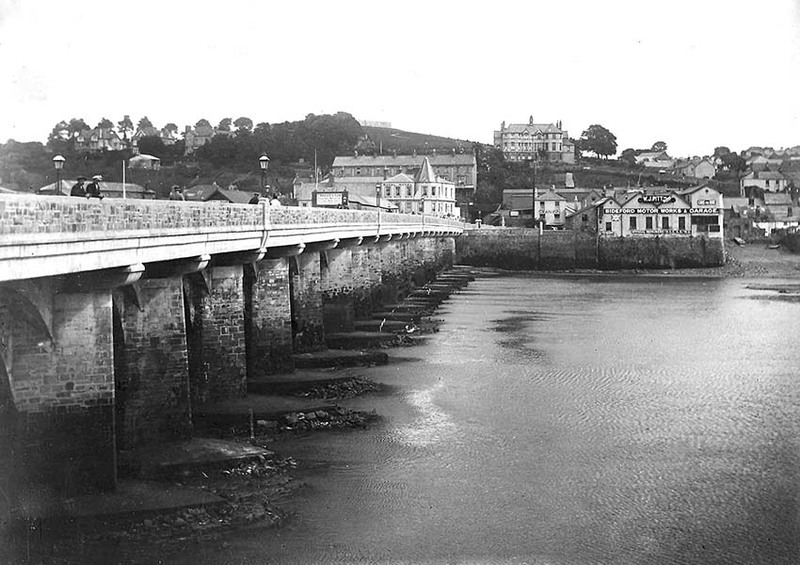 The broader bridge approach necessitated reduction in the size of the adjacent gardens, some of the granite posts from which were removed and re-sited at the lower end of Peace Park (aka Chudleigh Fort Pleasure Ground). 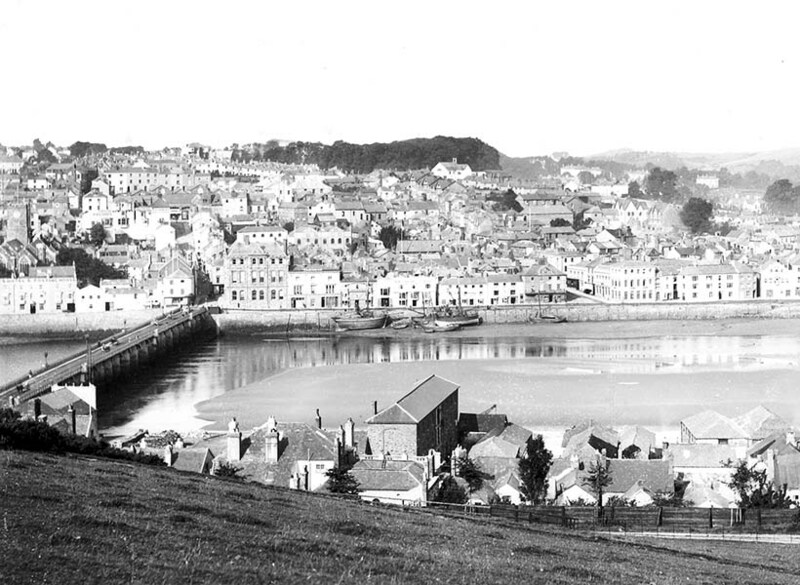 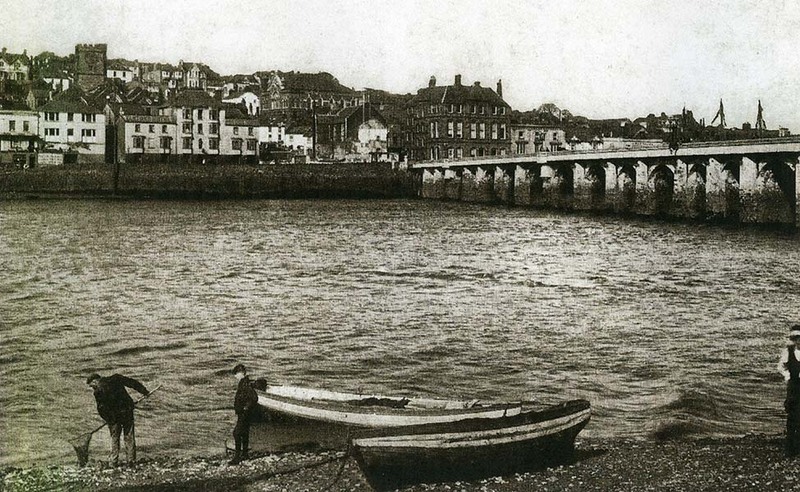 Early February of 1895 saw the River Torridge freezing over, then staying in that condition for several weeks. 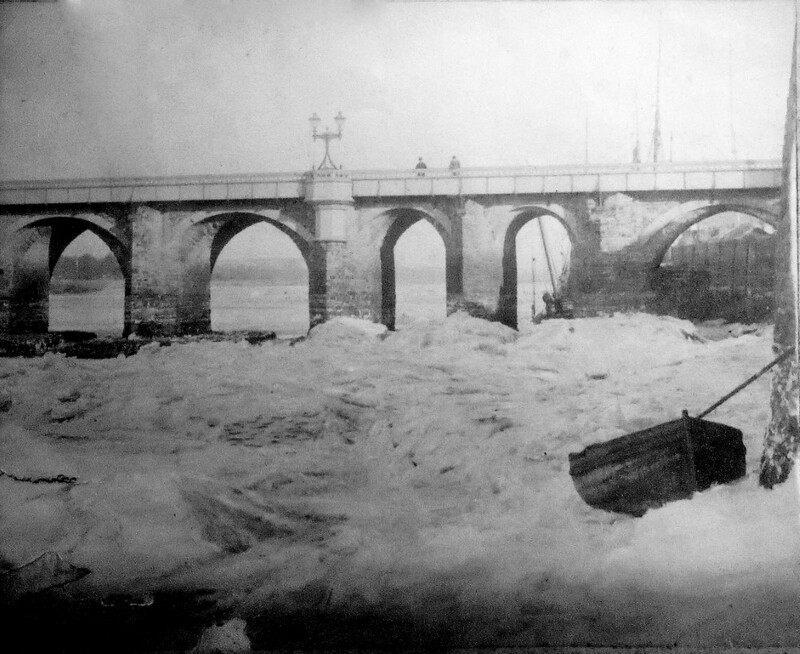 Such severe weather was unprecedented for fifty years and floes of ice formed upstream of the bridge, pressing against it and threatening to damage it. 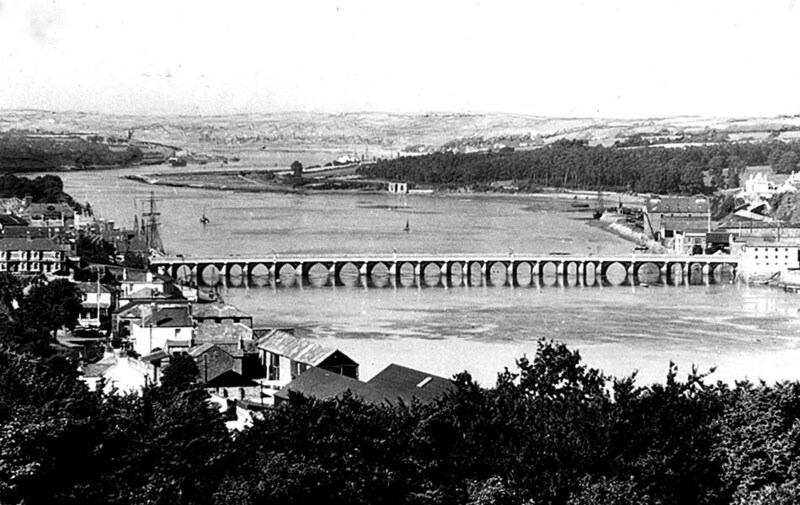 Moored vessels were icebound and a barge, in the middle of the river, remained immovably stuck. 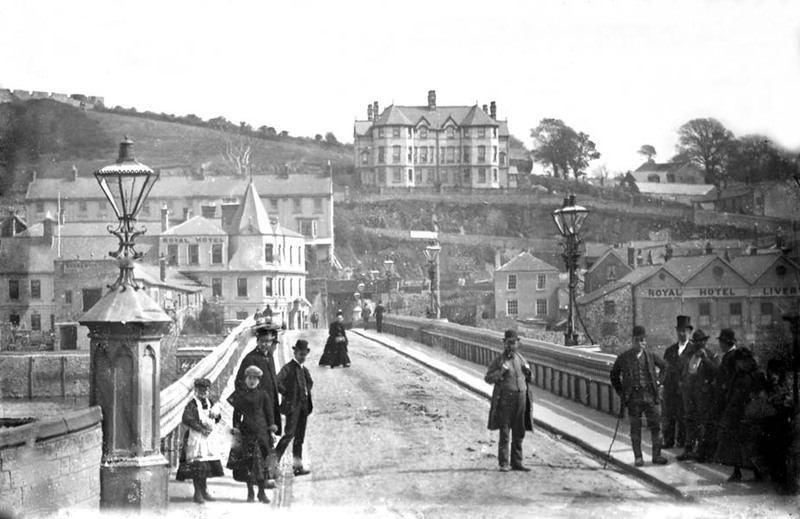 Mr. Dalby, the stationmaster, who lived where Torridge Auctions now stands, allowed the big furnace of his house to serve a soup kitchen for the poor. 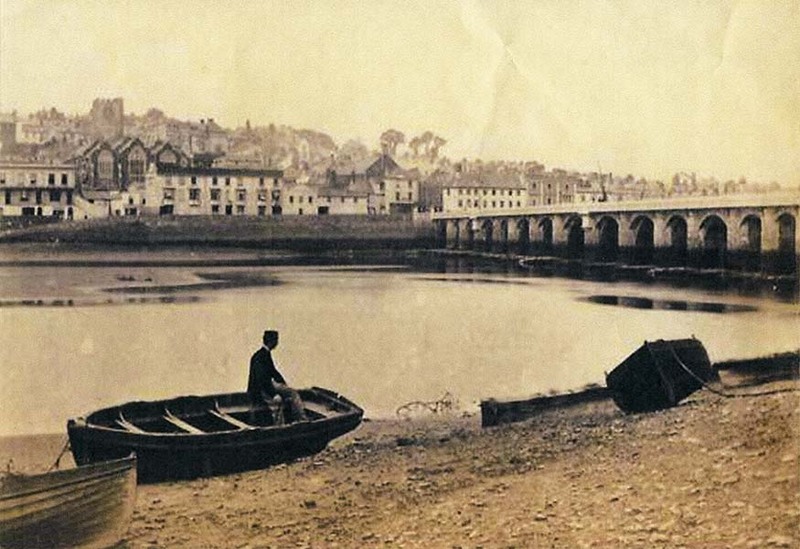 All was, however, not gloom, for Braddick and Son flooded a local marsh to create a skating rink. 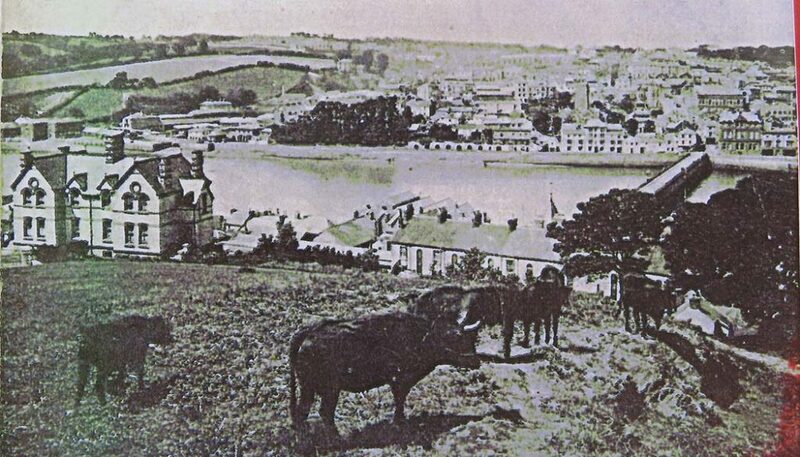 The precise dating of this picture is thanks to a dated copy (still on display in the Westleigh Arms in 2018). 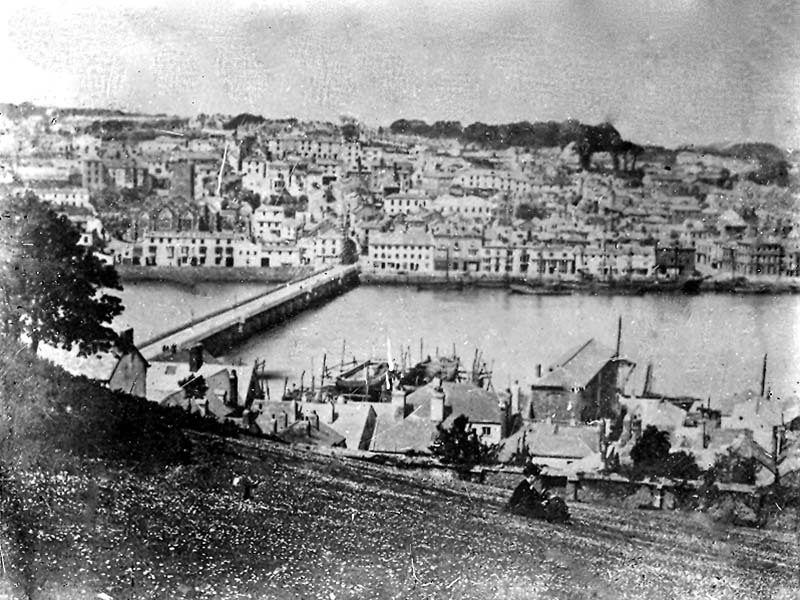 This view was taken looking North, from near 'Donkey Slip' (i.e. 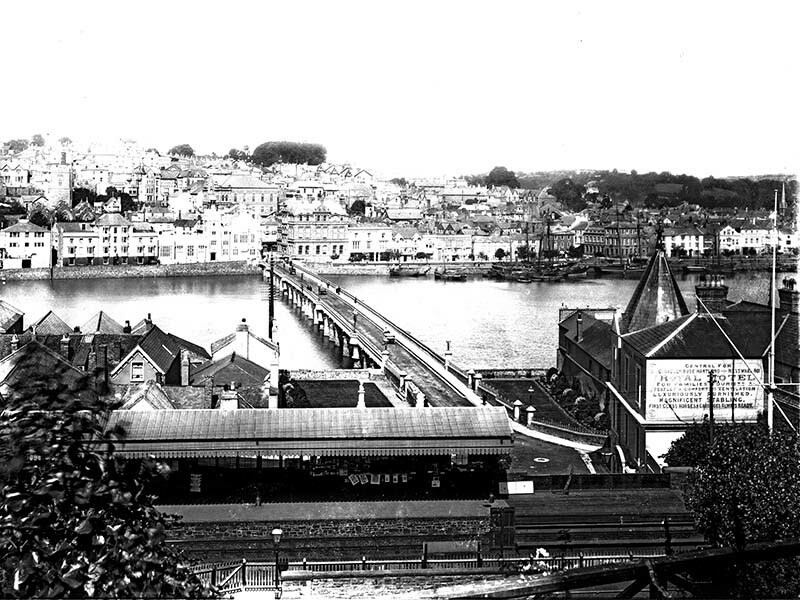 just south of the current Halfpenny Wharf). 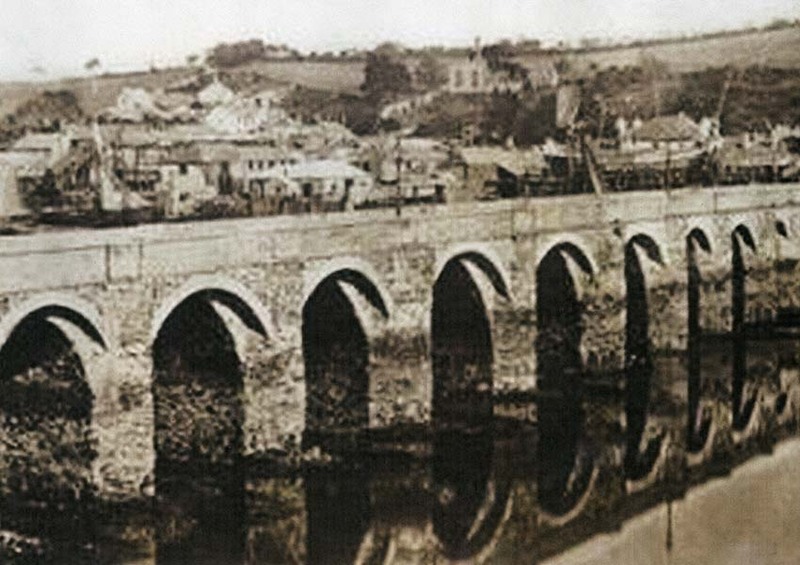 Clearly showing the widest arches of the bridge. 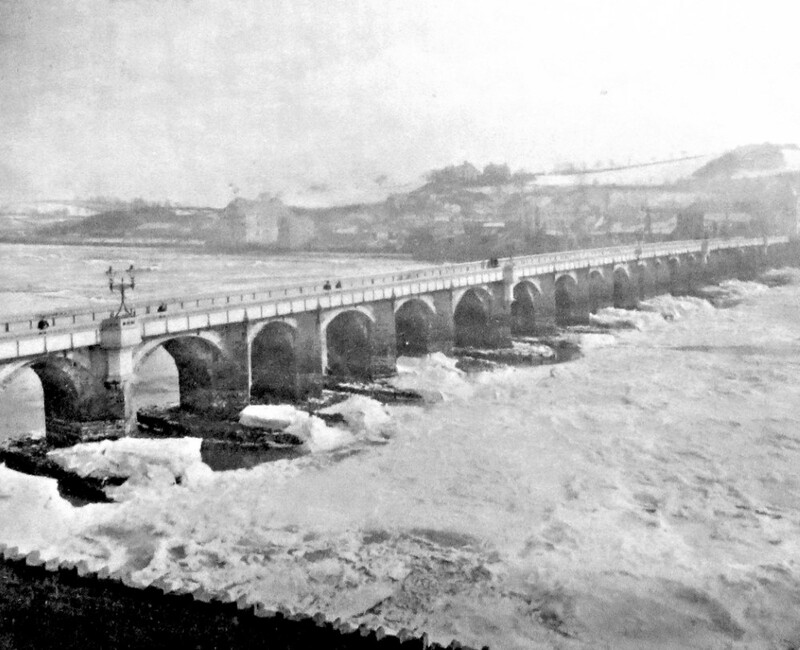 The River Torridge froze in early February and remained that way for several weeks. 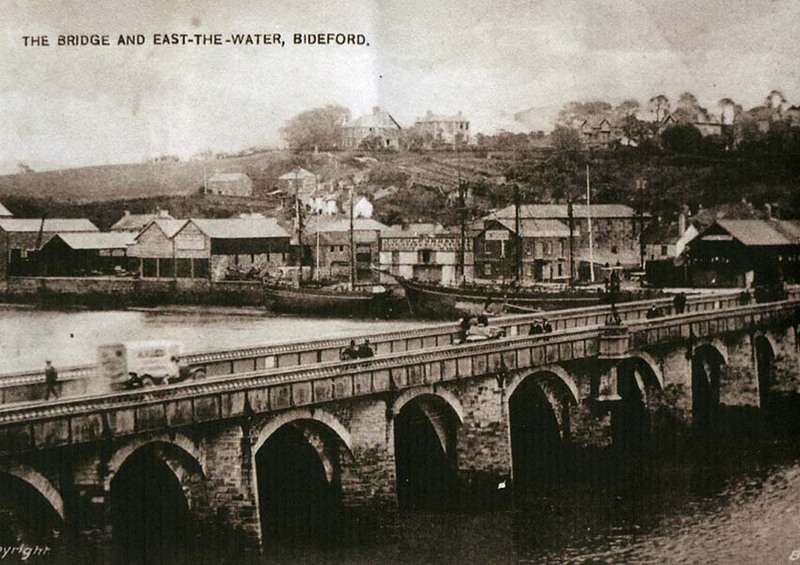 By 1895 when the cold shut down Bideford’s remaining shipyards, there were none on the eastern side. 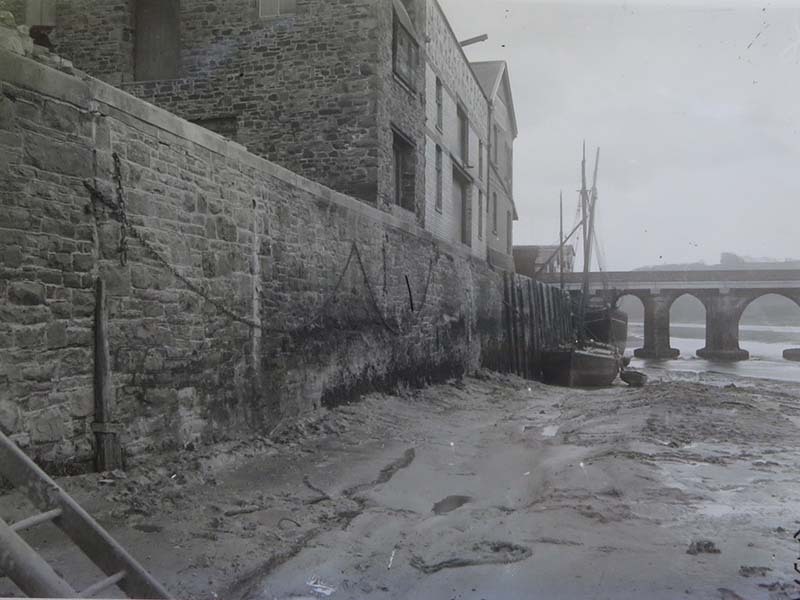 In January 1867, however, when similar freezing conditions closed the yards, Mr Johnson, of the Bridge End yard, gave each of his men and apprentices 4s. 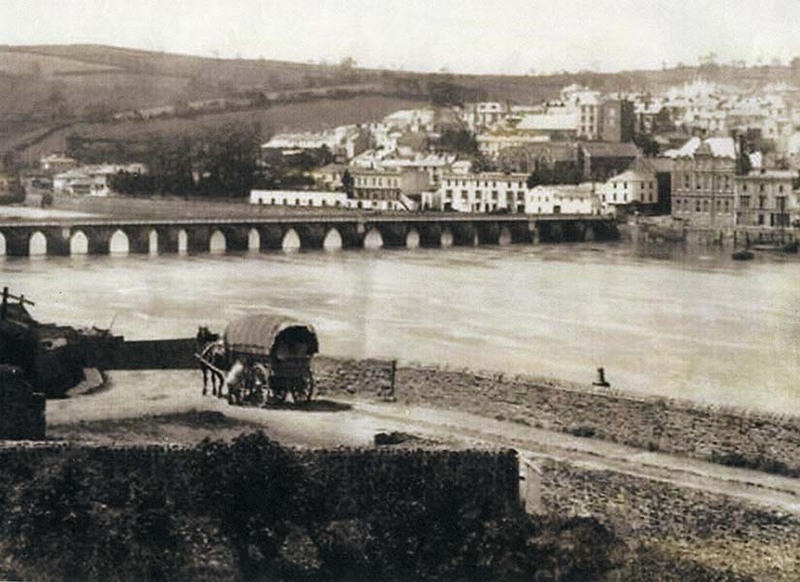 to tide them over. 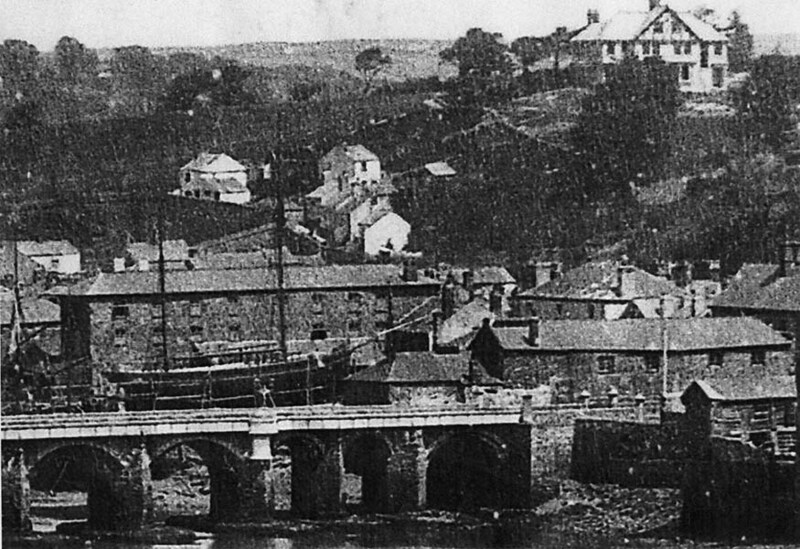 In the distance you can see one of the gasometers, the gas retort, and a chimney thought to belong to the electricity works. 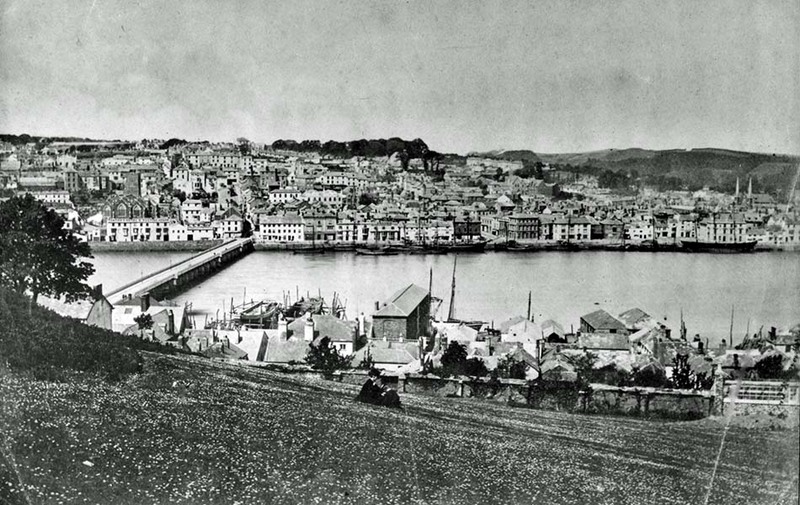 Postcard, date unknown.